When I search out new media to engage with, I often take time to research it well in advance. I want to know who made it, what they intended by it, how they approached it, and whether or not people I trust enjoyed it. However, every now and then I go into something cold, as I recently did with Edens Zero. Other than knowing the manga was a relatively new release, I had no foreknowledge of Edens Zero; I could not have told you the premise, pointed out a cover on the shelf, or named the mangaka if asked. With nothing other than my wits about me, I set off to see what new adventures awaited. Edens Zero is an action-adventure manga by Hiro Mashima, whose prior works include Rave Master and Fairy Tail. The story centers on Rebecca, a star-hopping explorer who travels the stars with her cat sidekick Happy, making video content for the subscribers to her B-Cube channel. She journeys to the planet Granbell and finds a theme park abandoned by humans. Now only the animatronic park robots remain. Rebecca and Happy set out to find interesting events to record and happen upon Shiki, the planet’s lone human who has been raised there since birth. Shiki is direct and unrefined, and he possesses an ancient technology called Ether Gear. This weapon gives him superior strength and gravity manipulation, among other things. Soon enough, trouble appears when the robots of Granbell turn on the trio and Shiki must save Rebecca from his former friendly automatons. Once the dust settles, Rebecca invites Shiki to join her and Happy for more adventures throughout the Sakura Cosmos, creating content under the auspices of the Adventurer’s Guild. If the premise sounds familiar to you, then you are not alone. For as little as I knew about Edens Zero going into it, the only surprise I found was how familiar it all felt. I deduced early on that the work bore a resemblance to Fairy Tail given the look of the lead three characters (particularly the cat mascot) – even though I had never seen/read Fairy Tail. My suspicions were confirmed when Shiki all but winks at the camera and the leads from Fairy Tail appear in a background shot. Much of the premise is well-worn territory as well. When you have a rough around the edges young man from the sticks with a special power who meets a savvy woman with a knack for technology and they travel the world together in search of adventure… well, let’s just say the premise will not turn a lot of heads. There is nothing inherently wrong with familiarity though. Many varied stories have superficially similar elements – especially in their early phases. 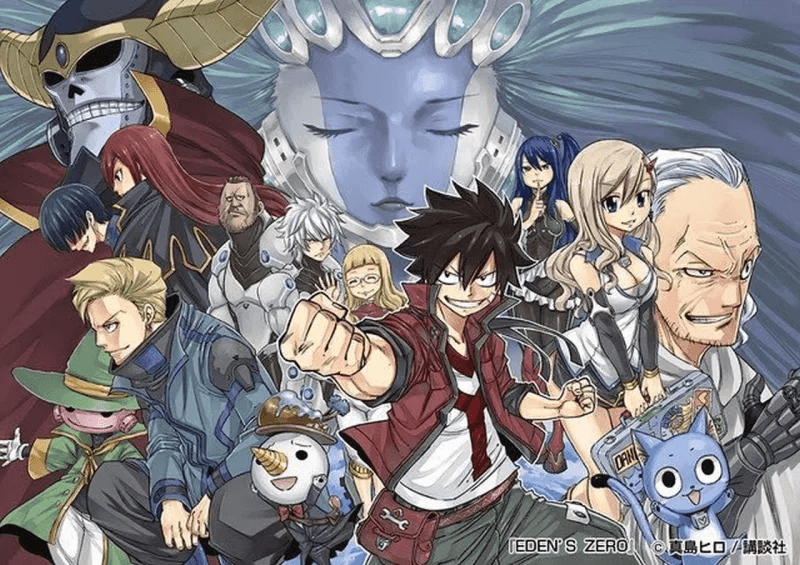 Perhaps Edens Zero is too early in its run to have found its voice; five chapters of manga is not a lot of room to breathe when you have characters, worlds, and ground rules to establish. The narrative certainly seemed to pick up in the final moments, with the introduction of Weisz and the time distortion plot. Time seems to be the primary theme at play. The audience is introduced to a narrator in the fifth chapter who tells us how little time matters to this tale. Another flashback implies that we are seeing the beginning and end of a story all at once, and that the core cast are experiencing such flux in their capacitors too. When journeying to find the aforementioned Weisz, Rebecca and Shiki find he is fifty years younger than they expected – and so is the rest of the planet. Hiro Mashima’s art is certainly pleasant. His line work is crisp and he has a knack for comedic expressions. The setting itself is a draw for the eye. The imaginative backgrounds and various exotic locales are the true standouts in these early chapters. More than a few two-page spreads are given over to alien vistas and lavish futuristic cityscapes, whose minute details reward the extra time spent admiring their intricacy. The character designs are more run of the mill. Most of the main cast is well-drawn but not terribly inspiring. Shiki, Rebecca, and Happy are basically the starter pack for a manga action-adventure core cast, and bear more than a passing resemblance to some of Hiro Mashima’s other famous creations. Thankfully, the supporting cast is much more visually interesting. From the mysterious planet-sized Mother to the adorable faux-feudal robots of Granbell, the designs can be quite evocative. I greatly appreciated the chromed-out street toughs Rebecca and Shiki make short work of in the second chapter in particular – but then I am a known proponent of goons, mooks, and expendable baddies in all works of fiction. Conceptually, the core cast was mixed. I felt Shiki was the least interesting of the three – he wants to make friends and punch villains. There is not much else to tell, really. Rebecca and Happy were more engaging, with the introduction of early rivals and some emotional stakes. We are treated to some flashback sequences involving their relationship that helped add depth to their present circumstances. Most fascinating is their relationship with Weisz and the potential ramifications of their jumping through time to his younger days – whether Edens Zero will deliver on that remains to be seen. I would be remiss if I did not mention the fan service elements at least in passing. Whether or not the presence of fan service will affect your experience is something we all have to be mindful of in media. I can only speak to my experience, of course; fan service of the female characters was definitely present. It had no appeal to me, but I did not find it out of bounds for a shonen title. If you have read similar manga in the past, then much like other elements of Edens Zero, you probably know what you are in for already. That is perhaps the greatest criticism I can level at the manga in these first five chapters – you largely know what to expect. There are a few bright spots that could lead to promising outcomes, but by and large it was very rote. Based purely on what I read, Edens Zero is not disappointing but not groundbreaking either. But who knows? 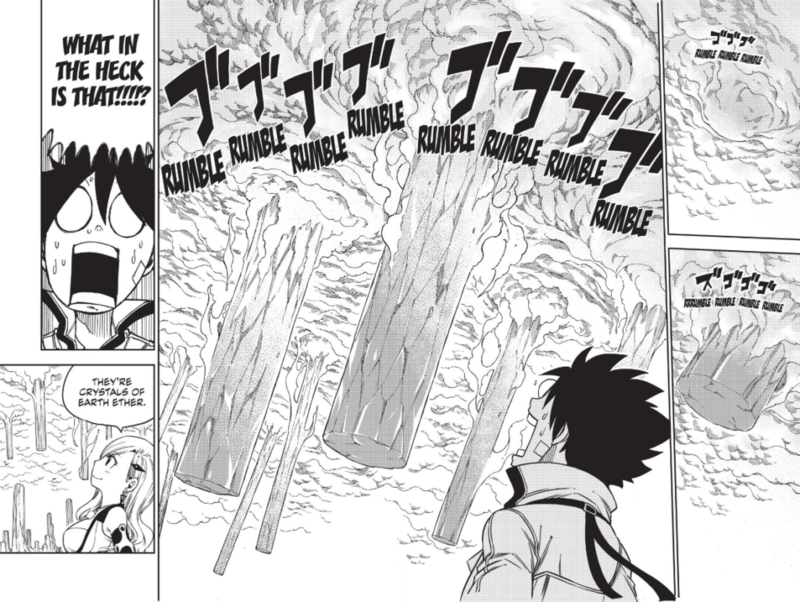 Edens Zero is early in its run, and given some time Hiro Mashima may show us that he has a few surprises in store. You can read more about Edens Zero on Anime-Planet, read a preview on Kodansha’s website, and order the first volume on Amazon. Special thank you to Kodansha for giving us the opportunity to review this manga.